Application: vibration isolation of equipment like pumps, fans, diesel engines, mills, presses. Suitable for suspension in motor vehicles. 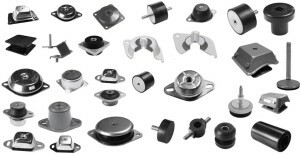 Anti vibration mountings limit the inﬂuence of vibrations and noise on people, equipment and the environment. Antivibration mountings are the most effective modern tool in a fight against structure and air borne vibrations and noise. They can achieve an effective isolation for nearly all machines and vehicles and can provide a good damping for a wide range of constructions. Our av-mountings are used in various applications. They meet the demands of industrial market, delivering a comprehensive solutions for nearly all industrial applications. Generally used for those machines which generate vibrations due to their rotating or reciprocating elements, like combustion and electric engines of all sizes, generators, compressors, pumps, fans, various electronic equipment, presses, lathes, grinders, etc. We are also well known in the rail, marine and off-road markets. Mountings are used as suspensions of chassis, bodies and engines in public service vehicles, private cars, various rail and building vehicles, under engines in marine crafts, and all other applications, which need a strong, reliable and efficient flexible couplings. Our engineering team offers complete advisory services and a comprehensive technical solutions, including professional selections according to customers technical information and computer software. We are ready to deal with every problem concerning vibrations and noise.